Two different atoms from the main group often bond together to make diatomic molecules. In most cases, the molecular orbital picture does not change very much from what we have already seen. From a Lewis point of view, some very simple compounds include the hydrogen halides. For example, HF contains a hydrogen bonded to a fluorine. 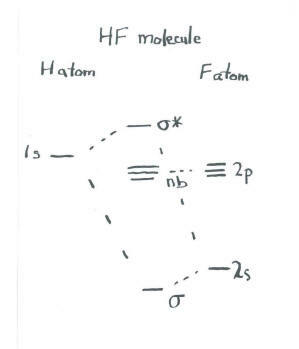 A molecular orbital picture of HF could involve an s orbital on hydrogen interacting with an s orbital on fluorine. It may be that the three p orbitals on fluorine stay out of the way, do not interact with the hydrogen, and remain unchanged in the molecule. In that case, we are dealing with a picture of two s orbitals combining, as in dihydrogen. The only difference is in the starting energy levels of the atomic electrons. The electrons in fluorine are at lower energy than the electron in hydrogen. Thus, the molecular orbital picture is skewed, with one side of the diagram at lower energy than the other. The energetic differences of the two atoms are shown in the molecular orbital interaction diagram. There is a physical interpretation for this lop-sidedness. Notice that the bonding orbital is closer in energy to fluorine than it is to hydrogen. Often, energetic similarity correlates with structural similarity. We think of these bonding electrons as being physically closer to the fluorine as well. In other words, the electrons in this bond are not equally shared, but are held more closely by fluorine. More energetic similarity to one atom implies electrons are found closer to that atom. This idea is consistent with our ideas about bonding between dissimilar atoms. We would think of the H-F bond as a polar, covalent one. The idea that fluorine's electrons are at lower energy may be confusing. A 1s electron in fluorine is certainly at lower energy than a 2s or 2p electron in fluorine. However, a 1s electron in hydrogen is not necessarily at a lower energy than a 2s or 2p electron in fluorine. All the electrons in fluorine are at lower energy than the electron in hydrogen because fluorine has a much higher nuclear charge, with relatively little shielding from its own 1s electrons. Fluorine has a high Zeff, as evinced by its high electron affinity (high attraction for more electrons) and high ionization potential (large amount of energy needed to strip an electron away). Construct molecular orbital interaction diagrams for the following diatomic molecules. In each case, what is the bond order? Is the compound diamagnetic or paramagnetic?